NOTE: This article presents the results of on-going research. New findings are constantly uncovered as this research moves forward, and as soon as we are able to process those findings, and reach scientifically-verifiable conclusions, they are included in the article’s body. Much of Texas had almost nothing in the way of a true winter during the 2015 – 2016 winter season. Despite that, throughout much of the state it was possible to at least give our air conditioning systems something of a rest. Now that is about to change. As spring causes our trees to leaf out afresh, and as our lawn grasses begin to green up, we know our air conditioners will soon be working at full bore. At about the same time that happens, Texas insects — many of which were seemingly dormant during the cooler months — will also begin to re-invade our homes, offices, and places of work. Is there an association between these two events? Or are they disconnected, coincidental activities that just happen to take place at the same time? Well, hold onto your seat, because these two events — the constant or near-constant operation of our air conditioners, and the invasion of our homes and businesses by insects — are tightly linked in a definite, cause-effect relationship. Most insects are attracted to the dark, cool, high-moisture conditions found in indoor A/C evaporator coils and condensate pans. There, smack in the midst of a hot, desiccating, bright, sunny day, we find an entirely different kind of environment, one that is perfect for many species of bacteria, algae, yeast, and mold to thrive, often in symbiotic relationships that promote aggressive growth. Unless prevented, soon masses of these contaminants develop inside the air conditioner’s confines. Ensconced inside the air conditioner, those contaminants — in turn — attract a host of tiny organisms that are specially adapted to search out and feed on them. Before long those tiny organisms attract minuscule predators that are greeted with a plentiful supply of water to drink and a large amount of nutritious food to eat. There, inside the confines of your air conditioner, they and the bacteria, algae, yeast, and molds that started the process in the first place, act together in concert to attract an even wider array of insect and fungal life. You may have noticed that the foregoing describes a classical food chain. Yes, that linear network of links in a complex food web that begins humbly with primitive producers like algae and grasses. These primitive producers use the most basic building blocks in the environment, then mix in radiation from the sun, and use that mixture to make and attract a more complicated array of organisms that contribute more and more of the nutriment they live and thrive on. They and the nutriment they produce and attract makes both them and their food supply both big and strong, not to mention more tasty and attractive to ever larger organisms. And as this cycle progresses, an ever-burgeoning continuum of organism complexity develops until, finally, it ends more glamorously with the most advanced predators of all, the likes of humans, grizzly bears, and killer whales. Inside our air conditioners the food web is less complex and works on a smaller scale, but the effect is almost exactly the same. It begins with bacteria, algae, yeast, and mold, and these attract tiny organisms like springtails. The springtails attract predatory ants, and the ants attract predatory spiders. When this food web is allowed to operate unabated it soon turns our air conditioners into highly contaminated food-making machines — for bugs and microbes, though not for humans — that bring unwanted pests to our homes, businesses, and places of work. We will later describe the larger and larger organisms that become involved in the food web unique to air conditioning systems, but the picture is already clear. When bacteria and fungal spores come together under high-moisture conditions, and are then permitted to thrive unabated in our air conditioner coils and condensate pans, their presence leads inexorably to the presence of larger and larger organisms. NOTE: As with a number of other conditions encountered in ordinary life, what we perceive to be pests are often merely messengers whose presence indicates a separate, predisposing problem. Ants attracted to air conditioner contaminants are in this category. Although our natural reaction is to simply apply pesticides to kill the ants “and be done with it,” a better approach is to correct the predisposing contamination inside our air conditioners. Until we do that, the ants we kill will just be replaced by other ants from their colony in an on-going cycle that never ends. Yet, none of this has to be the case. The natural association between air conditioners and insects can be eliminated completely if appropriate air conditioner maintenance practices are followed. In this article we explain the vagaries of the air conditioner/insect invasion connection, and how home and business owners can guard against the insect problems that their air conditioning units can cause. Before delving into the bacteria, algae, yeast, mold, and insect connection, we should briefly explain how poor air conditioner maintenance can also lead to human health issues that rival, if not exceed, those associated with insects. “Dirty” air conditioners not only attract insects, they pose serious health hazards to all who breathe the air they condition. 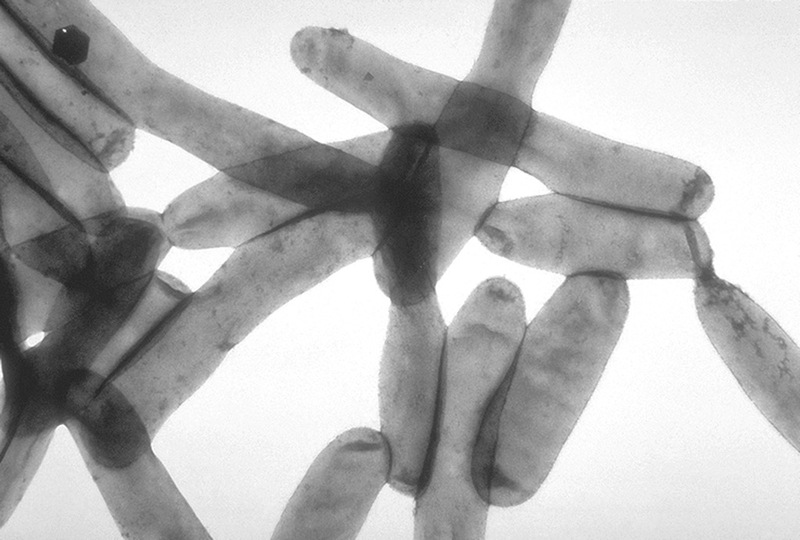 Legionella pneumophila bacteria, courtesy of the Centers of Disease Control (CDC). Today, health hazards emanating from our air conditioning systems are well known to microbiologists. After that fateful outbreak, in July of 1976, of a mysterious form of pneumonia — that was contracted by nearly 10% of the 2000 people attending an American Legion convention at the Bellevue-Stratford Hotel in Philadelphia — the connection between air conditioning and serious human disease became nothing short of legendary. A total of 182 of the attendees contracted the mysterious disease. Of those 182 cases, 29 died as a direct result of the infection. For the next six months nobody could say for sure what organism was involved in the outbreak, or what had caused the legionnaires to become exposed to it. Then, on January 18, 1977, the infectious agent was revealed. It was a previously unknown strain of bacteria, later named Legionella pneumophila. And its source? None other than the cooling water in the air conditioning towers at the Bellevue-Stratford Hotel. Those towers, it turned out, provided a perfect habitat in which the L. pneumophila bacteria could thrive, grow, and spread into the air — carried in the spray of aerosolized droplets that wafted from the open cooling towers, and that circulated in the air flowing through the hotel’s ventilation system — that the Legionnaires breathed. Legionnaire’s disease is perhaps the best known example of air conditioning gone awry, but its discovery was just the beginning. Today biologists who study contaminants of heating, ventilation, and air-conditioning (HVAC) systems know that not just Legionella pneumophila but a wide variety of pathological biocontaminants tend to lurk within our air conditioners. It is now known, for example, that more than 30 species of bacteria in the genus Legionella are capable of producing serious respiratory diseases in humans. It’s bad enough for the interiors of our air conditioners to be prone to bio-contamination, but their mode of operation makes them ideal mechanisms for spreading the pathogens with which they are contaminated. Every time their blower fans come on they are capable of lacing the air they condition with those pathogens, and of forcefully ejecting that air into the living spaces where humans live, work, and recuperate from medical procedures and illnesses. 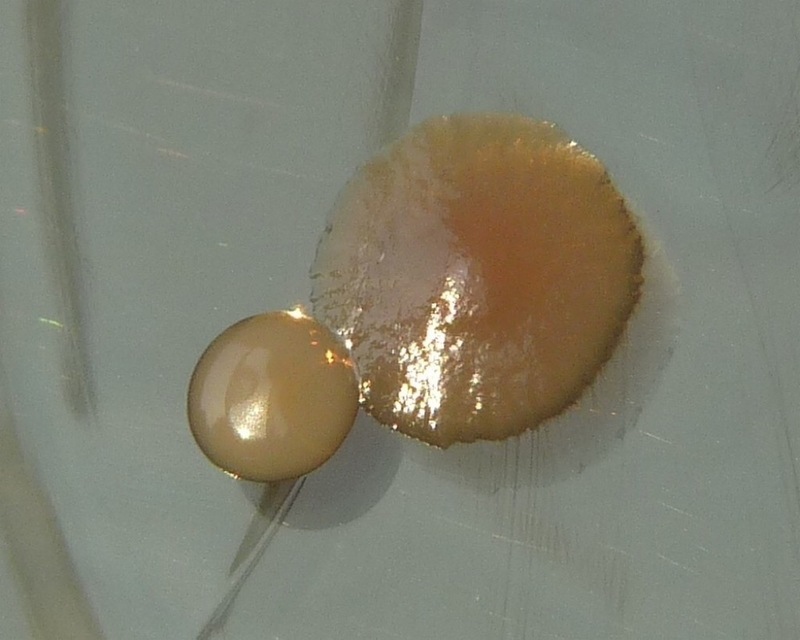 Pseudomonas aeruginosa (on right) and Staphylococcus aureus (left) colonies on tryptic soy agar. Courtesy Hans N.
The bacteria Pseudomonas aeruginosa, widely found in the environment, opportunistically colonizes moist components of active air conditioners, and can spread from there in the air we breathe. Serious Pseudomonas infections often occur in hospitalized people and in those with weakened immune systems. Blood infections, pneumonia, and other infections following surgery — all linked to this specific bacterium — often lead to severe illnesses and death. In many cases the source of these infections is none other than the room’s air conditioner. Most of the 100+ species of fungi in the genus Acremonium are easily colonized in the cool, moist environs of air conditioning coils and condensate pans. These fungi are opportunistic pathogens of man and animals, causing a variety of serious diseases. Though infections of humans by fungi in this genus are considered rare, it is likely that such infections are underreported, as the clinical manifestations include arthritis, osteomyelitis, peritonitis, endocarditis, pneumonia, cerebritis, and subcutaneous infection. The ubiquitous, black, yeast-like fungus Aureobasidium pullulans is another important air conditioner contaminant. The spores of A. pullulans are found throughout Texas and the United States in general. As with most fungal spores and bacteria, only the finest microfilters are able to stop their travel into the depths of our air conditioners. NOTE: The use of HEPA microfilters is prohibitively expensive for most homes and commercial establishments. As a result, almost all our air conditioners are fitted with less expensive OEM macrofilters that catch dirt and debris but provide gaping, open doors to airborne fungal spores and bacteria. When the fungal spores of A. pullulans land on the moist coils and wet condensate pans in an actively-operating air conditioner, they begin to develop into a thin, dark, slimy mass that coats the surfaces of the coils and the pan. As this mass matures it produces millions of fresh A. pullulans spores that are sucked into the moving air flow, to then be ejected from our air conditioners into the air we breathe. Chronic human exposure to A. pullulans spores, via humidifiers or air conditioners, often results in what doctors call hypersensitivity pneumonitis. Being a common contaminant of cold-water humidifiers, the condition is often referred to as “humidifier lung”. This condition causes shortness of breath, cough, fever, chest congestion, and lung inflammation. Where air conditioners are not being maintained properly, and individuals are experiencing chronic lung congestion, those individuals are oftentimes reacting to the presence of a large number of A. pullulans spores being spewed from the building’s air conditioners. 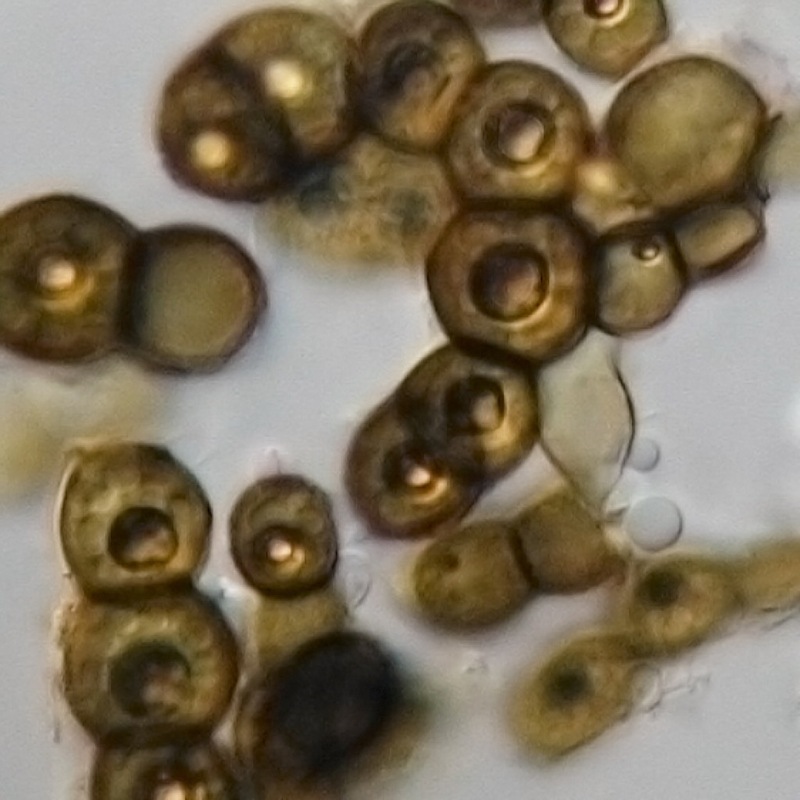 Fungi in the genus Exophiala often colonize in moist environments similar to those found inside active air conditioning systems. When this happens, their spores can infect humans, producing serious lung diseases, including another kind of hypersensitivity pneumonitis commonly known as “saxophone lung.” The common name derives from the fact that many woodwind instrumentalists have contracted the disease after failing to properly clean their instruments. The crucial importance of thorough cleansing of devices, instruments, and equipment capable of transporting microbial contaminants cannot be overstated. Even extraordinary cleansing procedures are not always able to prevent the spread of some diseases, though the incidence of such infections drops dramatically when such procedures are implemented. For example, mycobacterial contamination of heater-cooler units (HCUs) used with extracorporeal circulation during open-heart surgery has plagued hospitals worldwide for several years now, despite intensified cleaning and disinfection protocols intended to bring such contamination to a halt. The bacteria involved is most often Mycobacteria chimaera, but also includes several other species. M. chimaera is found almost everywhere in the environment, and does not normally cause disease in humans. Since 2010, however, clusters of M. chimaera infections have been observed postoperatively in cardiac patients in the U.S., Germany, Switzerland, and the Netherlands. These bacteria, whose initial source is yet unknown, apparently incubate in the cooling water of the HCU, from whence they contaminate aerosolized air emanating from the HCU, and are then spread into the air within the surgical suite by the action of the HCU’s cooling fan. Studies have shown that factory-new HCU units grew nontuberculous mycobacteria after a median of 174 days (slightly less than 6 months). Mycobacteria species include those causing tuberculosis and leprosy, but the species contaminating the HCUs are nontuberculous. All grow very slowly, and all are notoriously difficult to eradicate. Unfortunately, as with a number of other microbial agents plaguing mankind, when M. chimaera contaminate cardiac prostheses and vascular grafts, the infection may not become obviously problematic for years, but when it does emerge the consequences are often disastrous. This is because, for one thing, since the bacterium is growing on the prosthesis or vascular graft, surgical removal of the prosthesis or graft is a necessary first step, along with any surrounding tissue that may be infected. Some investigators have speculated that the HCU-based mycobacteria emanate from contaminations that occur during manufacture of the HCU. That may turn out to be the case, but it happens that M. chimaera is environmentally ubiquitous, and contamination models suggest easy contamination of the cooling water, from sources external to the HCU, after it has been installed in the surgical suite. Genomic sequencing of the various specimens of mycobacteria has seemed to indicate a point source, i.e., the manufacturer of the HCU, rather than the environment surrounding the various surgical suites where the infections occurred. But What is Meant by “Poorly Maintained”? Most of us know to change our air conditioner filters regularly. Many of us also know to flush our air conditioner’s condensate drain at the same time that we change our filters. Carefully following these two steps, on a monthly basis when the air conditioner is in use, is crucial to good air conditioner maintenance. Yet, that alone is not enough. If those are the only steps followed each month, most air conditioners will soon develop significant signs of poor maintenance, including the buildup of dirty-looking, nasty residues on the coils and inside the condensate pan. Perhaps if we had to observe that residue every time we looked at our air conditioner, we’d be more careful about keeping our air conditioner coils clean. Unfortunately, however, the evidence of contamination by bacteria, algae, yeast and mold is often hidden deep inside the air conditioner itself — interior to the dark and damp closed coil enclosure — where it cannot be seen with the naked eye. Consider now the case of the PTAC, or Packaged Terminal Air Conditioner. A PTAC, or Packaged Terminal Air Conditioner, placed in the wall under a window in an installation typical for most of today’s hotels, motels, hospitals, and nursing homes, and for many of the offices in commercial buildings. 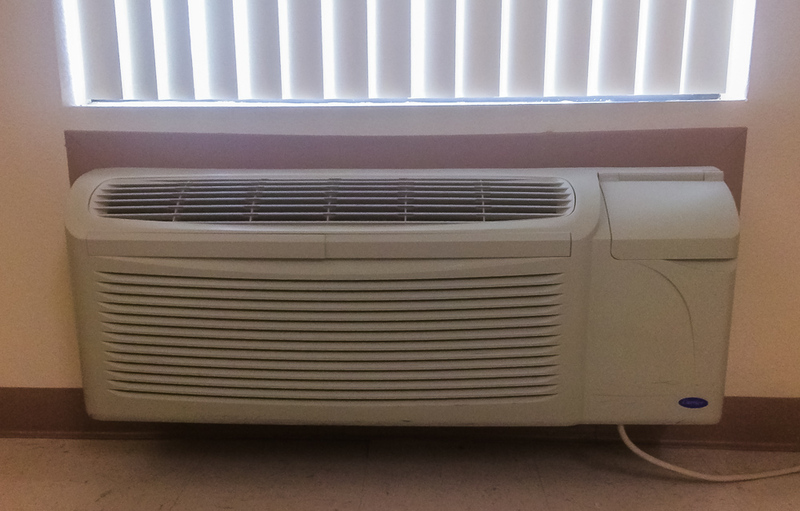 These are the under-the-window air conditioners found in most motels, hotels, hospitals and nursing homes today. They fit in an enclosure under one or more of the windows in the room, with controls on the unit itself, on a wall, or at both places. We’ll discuss, below, what happens to poorly maintained PTAC units. Unlike ordinary central air conditioning systems in most homes and commercial buildings, a PTAC’s evaporator coils are easily exposed to the naked eye for regular inspection. From this we can accurately infer what also happens to ordinary central air conditioning systems in homes and businesses with central HVAC systems, systems whose coils are usually hidden from sight. But first, what do PTAC manufacturers recommend be done to keep their PTAC units clean? cleaning the room-side cover (cowling) and outdoor vent filter monthly. cleaning exterior condenser coils every two years. The first of these three procedures is easily performed by housekeeping personnel. These personnel pull the filters up, out of the PTAC cowling, then wipe, vacuum, and/or wash them clean, and then press them down, back into the PTAC cowling. That job is not difficult to perform, does not require specialized chemicals or cleansers, and can be done by even the least skilled workers on the housekeeping staff. In most of the sites where PTACs are in use — places like offices, motels, hotels, hospitals, and nursing homes — that’s exactly what the housekeepers do, often on a very regular basis, i.e., weekly, bi-weekly, or monthly. The second procedure, monthly maintenance of a PTAC’s room-side cover and cleaning the outdoor vent filter — according to the Direct Supply Guide to PTAC Maintenance — includes vacuuming the room-side cover (cowling) of the PTAC with a soft brush attachment, washing any stubborn debris off the cover with a mild household cleanser, pulling the cover off to access the outdoor vent filter, and washing/replacing the outdoor vent filter. This work is usually done by facility maintenance personnel, as removing and replacing the PTAC cover is moderately difficult and even strenuous work, i.e., not the kind of task that a typical housekeeper would be expected to carry out. In the above-referenced guide to maintaining PTAC units, annual cleansing of the indoor (evaporator) coils begins with vacuuming dry debris from the coils using a soft brush attachment that will not damage the delicate aluminum coil fins. Once this is done, the coils are inspected to ensure no debris remains in the coil structure. If residual debris is observed, a mild household cleanser is sprayed into the coils to loosen the debris and flush it out. Annual cleansing of the interior evaporator coils is described as usually done with the PTAC in place. In some facilities this is done once a year, like clockwork. In others, it is not done unless the PTAC fails and either has to be repaired or replaced. In many sites, including hospitals and nursing homes where clean and sanitary PTAC units should be an absolute imperative, PTAC maintenance is an all but totally neglected procedure that maintenance personnel avoid like the plague. The author inspects PTAC units all over Texas, in a variety of commercial placements such as hotels, motels, hospitals and related medical facilities. What he often finds in those inspections is clogged evaporator coils loaded with biological contaminants. Often the cowling filters are clean, but sometimes it is obvious the filters have not been cleansed in a long, long time. Clean filters or not, the coil interiors themselves are almost always… well, I hate to have to say it, but filthy is the right word. The image at the left side of the screen , below (click on each image to view a larger version) is of a PTAC whose cover (cowling) has been removed, exposing the airflow exit grill on top, and the air intake grill, through the evaporator coils, on the front. Note the coating of debris on the vertical surface of the evaporator coils. This is a mixture of textile fibers, dust particles, spider webbing, and similar materials pulled in from the room, contaminated with bacteria, fungi, and other microbes found in the environment. Once this matrix is moisturized by condensate from the coils it occludes, the microbial contaminants begin to multiply, producing a microbial paste that feeds a growing microbial soup within the coils and the condensate pan. As this paste develops, it further occludes the coils, resulting in added accumulations of moisture, and accelerating the development of the PTAC’s interior microbial soup. PTAC with cowling removed, exposing the airflow exit grill on top, and the air intake, through the evaporator coils, on the front. Notice the layer of debris on the front of the silvery aluminum coils. This material begins as a matrix composed of dust particles, textile fibers, and spider webs, none of which was filtered out of the inflow of air from the room; this matrix coats the proximal surfaces of the coils, and intrudes into the coil structure, where it supports the development of bacteria, algae, yeast and mold; the reproductive lifeforms of those microbes easily pass through all but the finest microfilters. Closeup of airflow exit grille, showing debris composed of bacteria, algae, yeast, and mold deposited as conditioned air, laden with these contaminants, passed through the exit grille. They were too heavy to pass through the grille, but their presence confirms that the aerosols in the airflow were likely contaminated with small amounts of their reproductive lifeforms, some of which may have been capable of causing disease in humans. The photo at the right side of the screen, below, was taken of a PTAC grille over the port where air conditioned air flows out of the PTAC into the living space where it can be breathed by human occupants. The debris shown in this photo — littering the port floor and stuck to the grille itself — is composed of clumps of bacteria, algae, yeast and mold that had been carried by the PTAC’s air flow up and out of the system. Too heavy to pass beyond the grill, these clumps were left behind. Their presence provides clear evidence that the airflow from this PTAC is laden with aerosol droplets contaminated with bacteria and fungal spores, some of which may be capable of causing respiratory issues in the humans who breathe that air. It is important to note that the cowling filters in the PTAC units shown here were being maintained in full accord with, and even in excess of the manufacturer’s instructions and industry standards. In fact, the filters were being cleaned every week, four times as often as the manufacturer recommended. Yet, the evaporator coils (which the housekeepers who clean the filters never see unless they pull the cover off the PTAC, something they are not instructed by the manufacturer to do), and the airflow exit ports of these units were still laden with large amounts of contaminants. Though disappointing, this is not unusual. 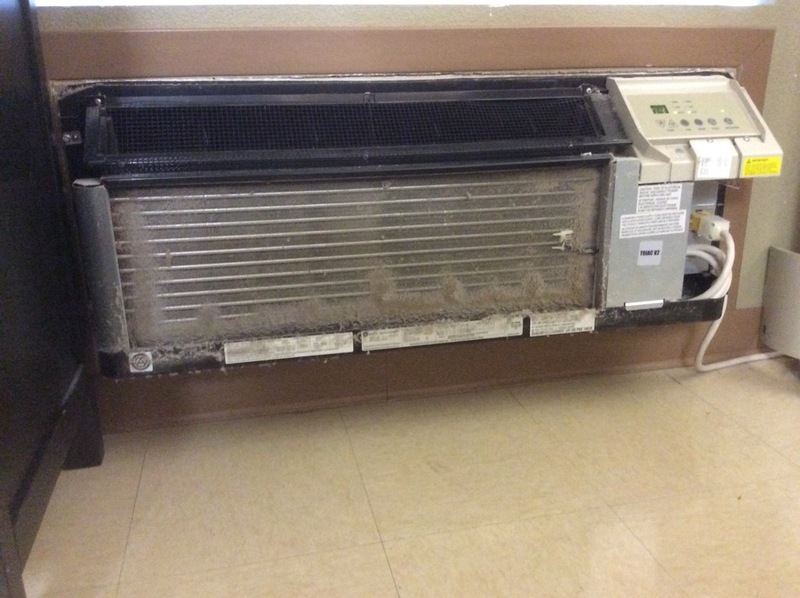 Although the manufacturer recommends cleansing the evaporator coils once a year, it is common for PTACs to be operated in hotels, motels, hospitals and other residential, commercial and medical facilities without ever having their evaporator coils cleansed on a regular basis. It goes without saying that everyone — the owners of the property, the staff, residents, and visitors — involved with that venue pays a price for that, and sometimes that price is pretty steep. There is a reason why effective maintenance cycles are rarely followed for the air conditioning systems around us. And it isn’t that nobody cares. Everybody cares about good health, and most of us care about saving money. If those involved knew the real cost in human health and dollars and cents that poor air conditioning maintenance leads to, good maintenance would become the norm. That is the goal of this article, to explain the real cost, in terms easy to understand, so those responsible for maintaining the air conditioners in our homes, motels, hotels, hospitals, and medical facilities will realize why they must do more. Some, by the way, already do more. For example, the nursing homes, hospitals, medical clinics, motels, and hotels that are serviced by EntomoBiotics Inc. have far and away the cleanest, most sanitary PTAC’s and HVAC’s in the United States. The maintenance and housekeeping personnel in those facilities know how important it is to keep their air-conditioners in top shape, and they work hard to keep them that way. Why is Poor Air Conditioner Maintenance the Norm? But serious attention to PTAC and HVAC cleanliness is not the norm. Why? In our experience there is no single answer to that question. Instead, a number of things have to be considered together to arrive at a reasonable understanding of the problem. To begin with, a high labor cost is involved. Following the manufacturer’s guidelines to the letter is ultimately hard work, time consuming, and expensive. —Merely replacing or cleaning the indoor filters takes time and, if replacement filters are used, at least moderately expensive. —Removing a PTAC from the wall, trucking it outside, and washing the coils out while being careful not to damage the system’s electronics, takes both time and muscle. —For a central HVAC unit, the refrigerant must first be drained out of the unit so the refrigerant lines can be decoupled from the coils; then the coils are pulled from the HVAC enclosure and taken outside to be washed and dried; the coils are then returned to the HVAC enclosure, the refrigerant lines reattached, and the unit recharged with refrigerant. Only licensed technicians are able to perform these tasks. Couple that with the fact that few people really understand the need. We do not intuitively recognize what happens when air conditioners are not maintained properly. The experts may be aware of the need, but — for some reason or another — they are not making a big fuss about it, so we’re not being told. Instead, users are often led to believe that all they need to do is change the filters on a regular basis, and that the rest of the maintenance recommendations are unnecessary. That seems to make sense, so most users go with it. It is natural to think that just changing the filters keeps the dirt and dust out of the coils: if they do that, they’ve done all they need to do. But that is far from the truth. Changing the filters alone will not keep dust and dirt out of most air conditioning evaporator coils. The enclosures into many, if not most evaporator coil housings are at least somewhat faulty, so that some unfiltered air gets past the filters. And the havoc the debris in that unfiltered air causes can be huge. The filters in the PTAC shown above were being cleaned every week, without fail. Wouldn’t those clean filters stop dirt from getting to the coils? Yes, in fact, they would — but only (1) in a PTAC whose design ensured its cowling fits perfectly when properly installed, (2) in an installation where the cowling is always perfectly installed, and (3) with intact, un-warped filters that fit perfectly in the slots they slide into. When those three conditions are met, they prevent the entry of ordinary dust particles and airborne debris. As mentioned earlier, in such a setting, the “dirt” on the coils is not what it appears to be. Our tests have shown that many of the PTACs installed in motels, hotels, hospitals, nursing homes, and office buildings are so poorly designed that even when their cowlings are perfectly fitted, large gaps exist around the cowling that allow significant amounts of unfiltered air to bypass the cowling’s filters. The cowling that goes on the front of the PTAC shown above, for example, has — even when it is perfectly fitted and installed on the unit — a 1.5 inch opening at its lower extremity, all along its lower edge, through which unfiltered air is able to enter without having to pass through the filters on the front of the cowling. That means the cowling, which has a bank of filters on its front surface, also has the equivalent of a 9.5 in. x 9.5 in hole at its base through which unfiltered air is permitted to flow. Worse, that gaping hole is at the lowest part of the cowling, where airborne dust and textile fibers are most dense. Early on in our investigations of the accumulations of debris on PTAC evaporator coils, we noticed that most of the accumulations were found on the lowest portions of the coil assemblies. Our first assumption was that this resulted from gravity-mediated accumulations of moisture that promoted algae and bacterial growths in those regions. To test this hypothesis we examined the accumulated debris under the microscope and, to our surprise, discovered that — for most PTACs we studied — the primary constituents of the accumulated matter’s proximal surfaces were textile fibers and dust particles. Investigating further, we found the gap, and realized the fibers had reached the coils by bypassing the cowling’s filter bank. Since the gap allowing this to happen was at the lower reaches of the cowling, that explained why the fibrous accumulations were greater at those portions of the coil surfaces. This condition is routinely observed in the majority of the PTAC units we inspect in nursing homes and hospitals. The lesson from this is that simply following the manufacturer’s recommendations won’t keep airborne debris and microbial contaminants out of the evaporator coils of most air conditioning systems. It has been our experience that, even if every preventive maintenance procedure the manufacturer recommends is carried out to the letter, that’s still not enough. 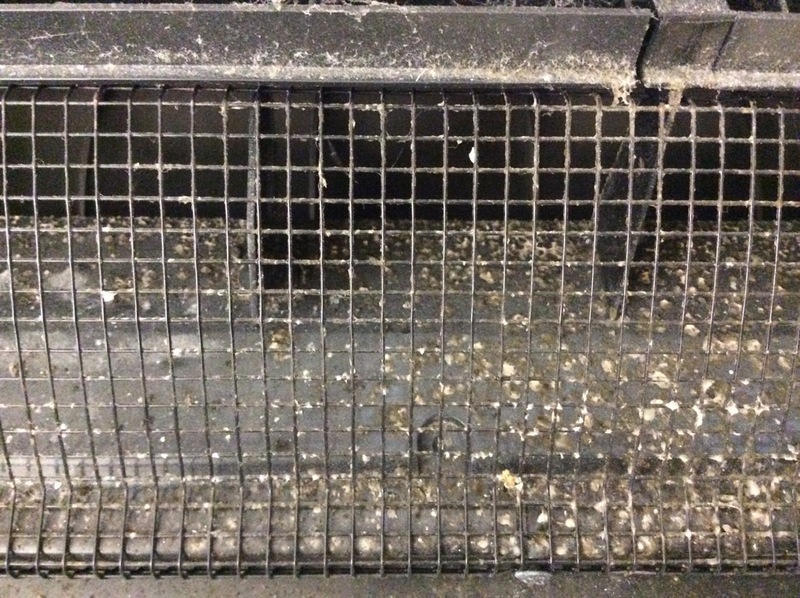 Mold, yeast, algae, and bacteria can begin to grow in the moist environs of a PTAC’s evaporator coils immediately after they have been cleaned, because their reproductive lifeforms are unlike ordinary dust particles or airborne debris; bacteria, and fungal spores easily pass through the mesh of most air-conditioner filters. In only a matter of weeks those contaminants can be present in sufficient quantities within the air-conditioner’s evaporator coils that they can contaminate the air flowing out of the PTAC, potentially affecting the health of all who breathe that air. We at EntomoBiotics Inc. are determined to find acceptable solutions to both of the two obstacles to good air-conditioner maintenance just mentioned. We’ve been working hard on both issues for several years now. In the coming days, weeks, and months, we’ll share with you, right here, all that we’ve learned. We will also share with you the solutions we have arrived at, and the results of our testing of those solutions in a variety of residential and commercial settings. Bolignano, Giuseppe and Giuseppe Criseo. 2003. Disseminated Nosocomial Fungal Infection by Aureobasidium pullulans var. melanigenum: a Case Report. J. Clin. Microbiology 41(9): 4483-4485. Joshi, A., et al. 2010. Subcutaneous mycosis and fungemia by Aureobasidium pullulans: a rare pathogenic fungus in a post allogenic BM transplant patient. Bone Marrow Transplantation 45, 203-204. Rodrigues de Oliveira, Leonardo, et al. 2013. Aureobasidium pullulans infection in a patient with chronic lymphocytic leukemia. Rev. Soc. Bras. Med. Trop. vol.46 no.5 Uberaba Sept./Oct. 2013. Schreiber, Peter W., et al. 2016. Reemergence of Mycobacterium chimaera in Heater–Cooler Units despite Intensified Cleaning and Disinfection Protocol. CDC Emerging Infectious Diseases, Vol. 22, No. 10—October 2016. Sommerstein, Rami, et al. 2016. Transmission of Mycobacterium chimaera from Heater–Cooler Units during Cardiac Surgery despite an Ultraclean Air Ventilation System. CDC Emerging Infectious Diseases, Volume 22, Number 6—June 2016. — Questions? Comments? Corrections? e-mail jerry.cates@entomobiotics.com. You may also register, log in, and leave a detailed comment in the space provided below.